The 13th book I've read this year fits category 29 of the PopSugar Reading Challenge - a dystopian novel. It turns out this category is one I'm really enjoying, and a few more on my 'to be read' list could fall here as well. 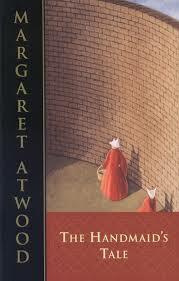 I read The Handmaid's Tale by Margaret Atwood, and now I'm planning to watch the movie again (I saw it years ago, but now I want to watch and compare while the book is fresh in my memory). It seems a lot of parts of the book was just in the narrator's head and won't translate easily into a movie, so I'm looking forward to seeing how they handled it all. Offred still remembers parts of what her life was like before she was assigned to just be a handmaid. They've taught her at the Red Center that things are better this way, but she's frequently not so sure. She wonders what happened to the people from her life before, and is never sure who she can trust with anything besides her conditioned responses. Can the whole civilization she knew have disappeared, and can it stay gone forever? I thought this was a more well-known book than apparently it is, at least among the people I see on a regular basis. I was excited to talk about it, but no one else I've seen while reading it knew about it. Hopefully in a few days hubby and I will get a chance to watch the movie and I can babble at him. I recommend this book. It's definitely not cheerful, but it will certainly get you thinking. I have never heard of this book. Sounds interesting. I have a huge stack of books I really need to get to. This book sounds really familiar. I can't do depressing right now.